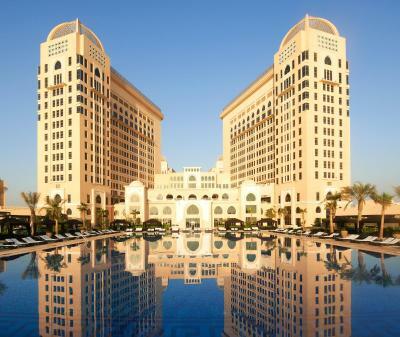 Lock in a great price for The St. Regis Doha – rated 8.8 by recent guests! Rooms are spacious and clean.. pool is big.. nice ambiance.. accommodating staff.. buttler service are very good.. beds are comfortable.. The ambiance and the facilities were great, edpecially the Olympic size pool and the gym. Our buttle Louie was absolutely fantastic! We were on our honeymoon and he made every detail special. All Staff do their best to make your stay memorable. Pool and beach area service was superb, I have not experienced such service in any other resort so far. 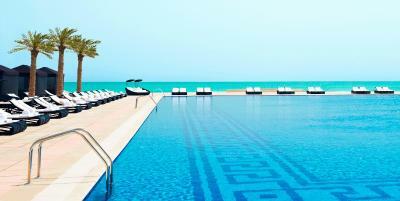 Olympic size pool with clean and temperature controled water is perfect for swimming. BTW, Reception accepted our request for early check-in and late check-out without any extra charge. The rooms are very clean and very tidy. The beds were extremely comfy and the service is quick. Nice location lots of services and is great in general. Hotel staff were excellent very friendly , helpful and knowledgeable. Hotel facilities were outstanding and room design as well as bathroom amenities were amazing. 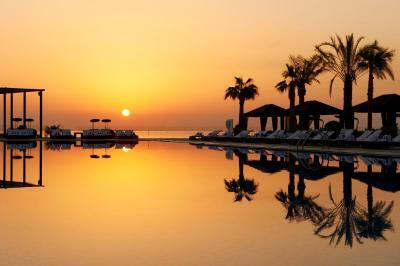 Hotel facilities were outstanding and staff were friendly , supportive and very knowledgeable. Room design and decoration was excellent as well as all my requirements were available . 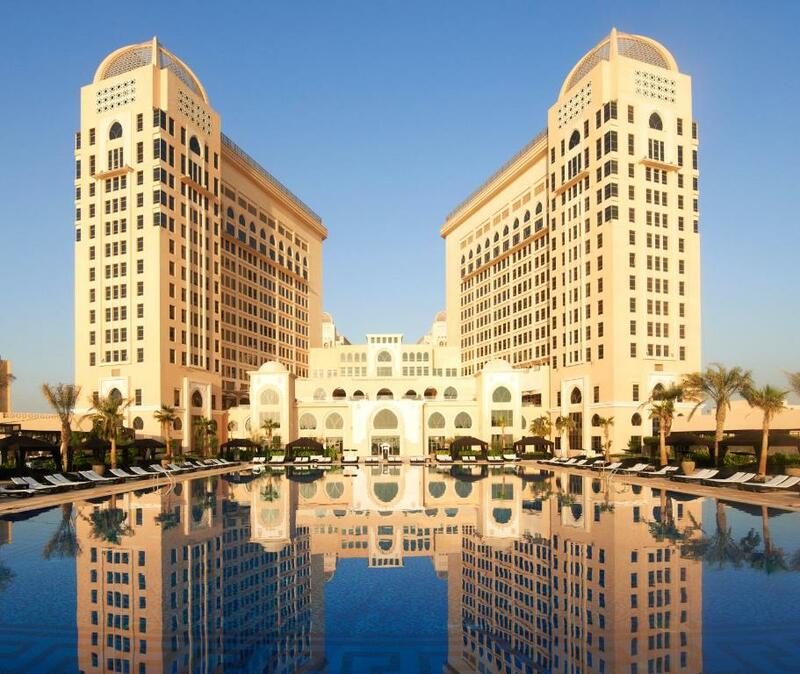 The St. Regis Doha This rating is a reflection of how the property compares to the industry standard when it comes to price, facilities and services available. It's based on a self-evaluation by the property. Use this rating to help choose your stay! 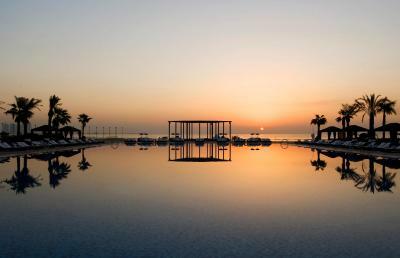 This 5-star hotel features a private beach area, an outdoor swimming pool, and tennis courts. 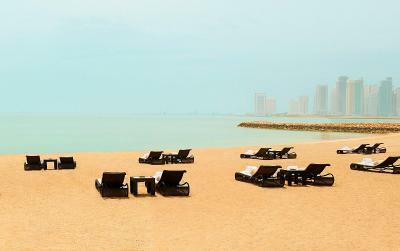 All air-conditioned rooms have views of the Arabian Gulf and private marble bathrooms. The spacious, modern suites at the St. Regis Doha include a 42-inch flat-screen TV and an iPod docking station. The bathroom is stocked with Remède toiletries and comes with a deep soaking tub and a separate rain shower. The St. Regis offers 10 restaurants including 2 restaurants by Gordon Ramsay. The premises contain a number of bars, including The Club. The hotel offers valet parking, a concierge, and a 24-hour butler service. Guests can enjoy a relaxing massage at the Remède spa and wellness center. A fitness center and sauna are also available. 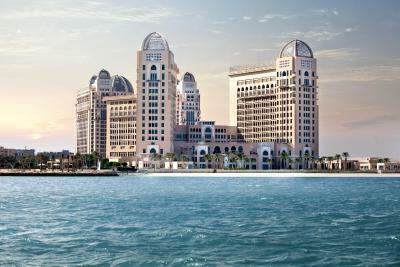 The St. Regis Doha is located less than 1.2 mi from the Qatar Exhibition center, and less than 3.1 mi from The Pearl-Qatar man-made islands. It is just under 15 minutes’ drive to City Center Mall. 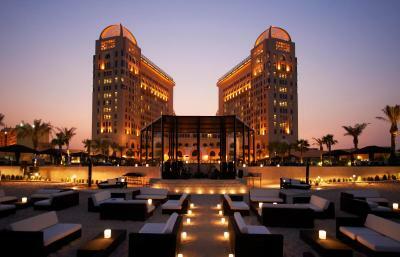 When would you like to stay at The St. Regis Doha? Hotel surroundings – This neighborhood is a great choice for travelers interested in relaxation, beaches and family-friendly trips – Check location Excellent location – show map Guests loved walking around the neighborhood! 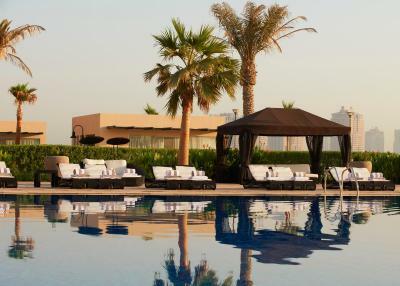 House Rules The St. Regis Doha takes special requests – add in the next step! 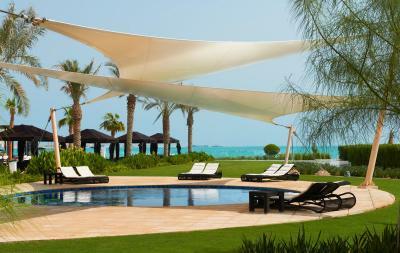 The St. Regis Doha accepts these cards and reserves the right to temporarily hold an amount prior to arrival. Please note that the property offers free WiFi and cable internet in all rooms & suites with a speed limited to 512Kb. Higher speed is available at a surcharge. Please note that all rooms that contain two double beds cannot accommodate any extra beds. Please note that Qatari couples checking in to the same room must present a valid marriage certificate upon check-in as per Qatari law. Please note that Qatari females must be 30 years old or above to check in and must show valid identification, unless accompanied by an adult. Qatari males must be 21 years old or above to check in. 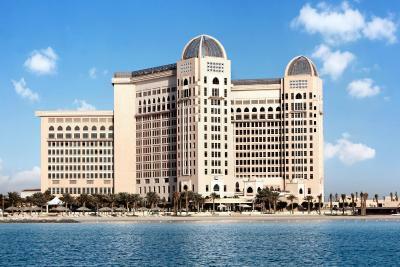 Non Qatari guests must be over 18 years old to check in unless accompanied by an adult. The gym was probably the only let down of our stay as it was very small with limited machines. Not what I expected from a 5 star hotel. The pool and beach were wonderful and the breakfast buffet delicious. The staff were very accommodating and helpful making sure we had what we needed. Astor Grill was delicious and we had a very relaxed glass of prosecco overlooking the pool and sea on our last night. Will definitely be visiting again as regularly as possible! Food service was a bit slow. Astor grill. Food and service top class! All staff very helpful and conscientious. They all remembered my daughters name and were very helpful and friendly. Perfect breakfast, nice room and sea view, good hotel in general. Havent found anything to be unsatisfied with. Great services, e.g. take away brekfast early morning to the airport was awesome, even with coffee and juice. Everything was okay, there was nothing I disliked about my stay. Luxery .amazing view. Comfortable bed. Perfect breakfast.